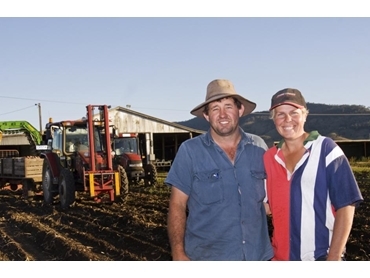 Queensland farmer David Litzow made the move into organics two years ago, after realising that vegetable farming would require less water than his lucerne and barley operation. Diversifying his farm meant diversifying his machinery too, and he recently upgraded his equipment, adding the versatile Case IH JX1100U to his fleet. “When we switched farming strategies, we needed more gear to handle the work. The JX1100U appealed to us because we needed a versatile tractor in the 100 Hp range. It’s also got row-crop wheels and is easy to manoeuvre, making it well suited to vegetable growing. David also chose a JX90 tractor, upgrading from a MX80C model. “Our operation is really only just starting to grow, so for us it’s vital that we have the equipment to get the job done,” he said. On average, David’s operation, Black Crow Organics, produces 14-19 tonnes per hectare of pumpkin and potatoes, and around 0.16 tonnes of broccoli per hectare. He also grows zucchinis, but the yields are variable and difficult to estimate.